Republican Utah Sen. Mike Lee delivered a speech on the Senate floor arguing against the Green New Deal. 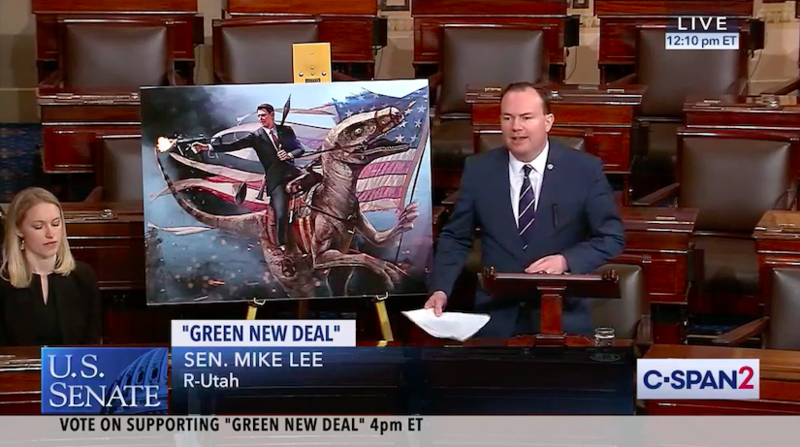 Lee displayed a picture of President Ronald Reagan firing a machine gun while riding on the back of a dinosaur to explain how unrealistic the Green New Deal is to solving climate change. 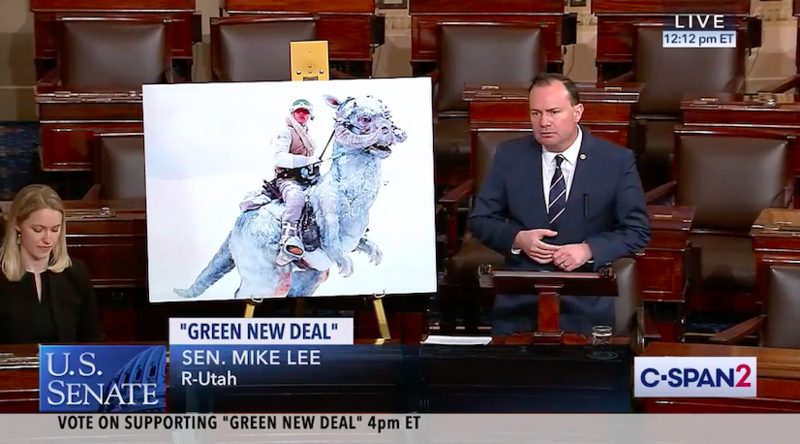 Lee mocked the Green New Deal’s proposal to eliminate airplanes by arguing Americans would need to ride Tauntauns and Aquaman’s 20 foot seahorse to fly to Alaska and Hawaii. Republican Utah Sen. Mike Lee argued against the Green New Deal on Tuesday by mocking two of the most controversial, and often ridiculed, policy proposals in the resolution: eliminating air travel and flatulating cows. Lee began his speech by displaying an image of former President Ronald Reagan firing a machine gun while riding on the back of a dinosaur, waving an American flag. Lee argued that there is not even one serious proposal in the entire Green New Deal and singled out the resolution’s call for a World War II-style mobilization effort to eliminate greenhouse gas emissions like methane, that arise from cow flatulence. He also highlighted the call to rid air travel. “We set a goal to get to net-zero, rather than zero emissions, in 10 years because we aren’t sure that we’ll be able to fully get rid of farting cows and airplanes that fast,” reads the initial version of the resolution’s fact-sheet, which has since been removed. “[Eliminating airplanes] might seem merely ambitious for politicians who represent the densely populated northeastern United States, but how’s it supposed to work for our fellow citizens who don’t live somewhere between Washington, D.C., and and Boston?” Lee asked, taking a thinly veiled shot at the resolutions’ Democratic sponsors, New York Rep. Alexandria Ocasio-Cortez and Massachusetts Sen. Ed Markey.